The Mid Mod project is complete! It was a tall order to bring order to a landscape in chaos, preserving the natural landscape surrounding this mid-century modern style home. Here are photos showing how it all came together! Follow us on our journey with before and after photos of what we are calling our Mid-Mod Makeover project. BEFORE: This unique home has many features of the famous mid-century modern designers – floor-to-ceiling windows, vaulted beam ceilings, and fireplaces serving as a massive focal points. However, its surrounding landscape needed an ultimate renovation. 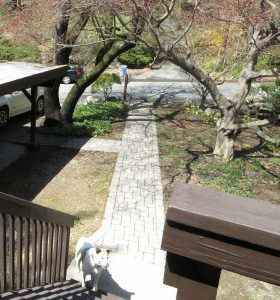 A massive stone outcropping flanking the home…. and a beautiful mature Japanese Maple, demanding its existence as a focal point. Collaborating on this project with a local landscaper, Neave Group, a big goal was allowing the design to follow function. This home has 2 front entrances, with an upper and lower door, establishing some confusion as to which door welcomed guests. Therefore, the design prioritized highlighting the upper entrance while obscuring the lower entrance from the street view. The lower entrance served as an access point from the carport and maintaining its functionality was a crucial element in the design. In addition, the mature trees overwhelmed the property, shading the property disproportionately. The property lacked small to mid-size foliage, creating a void of anything interesting to experience, either visually or spatially. 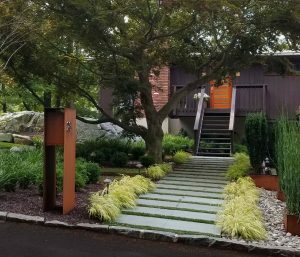 With design and vision, this landscape has been returned to minimalist grandeur, incorporating Planterscape’s CorTen steel planter boxes and other landscape elements. 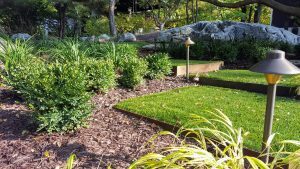 The project began with the removal of trees and overgrown unsightly shrubs, providing both sunlight and a proper site for a spot of lush grass. A graceful transition was required to lead guests from the sidewalk to a small easy-to-care-for circular area of grass. Planterscape’s custom CorTen planting beds were nestled into place, forming a floating grass pathway leading the way to green sun-lit bliss. Keeping maintenance to a minimum, these beds were fitted with artificial turf. Mowing and trimming completely averted! 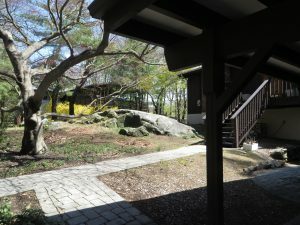 The floating grass pathways gracefully bridge the house to nature, inviting one to experience more than the hardscape. Landscape lighting was added, extending an evening invitation to explore and meander the pathways. Flood lighting was directed to the stone outcropping, elevating the the area spatially and complementing the visual interest of the natural elements of this area’s topography. Planterscape’s grass planting beds, 7 in total, alternate between square and rectangle shapes, defining an expectation for something different. This bespoke “L” shaped planter became the home for a green screen, allowing more privacy for the home’s lower glass-heavy entrance. Three over-sized square planter boxes, just beyond, create structure and form. 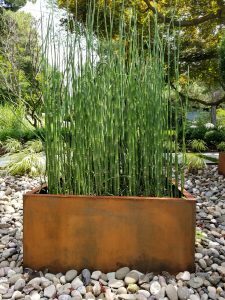 The planters boxes serve a purpose driven home for fast-growing equisetum – a rigid, segmented, bamboo-like plant that is beautiful and modern. 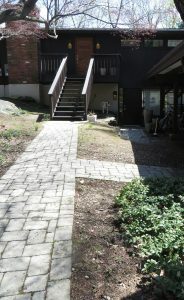 AFTER: Alas, the modern welcoming landscape! Functional and beautiful….and low maintenance! 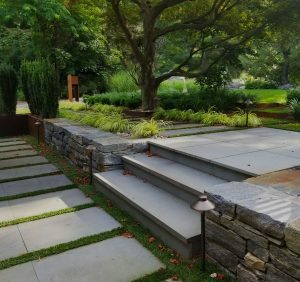 The artificial turf was carried through the bluestone walkways, keeping an easy-to-maintain walkway that demonstrates the softening of a hardscape without losing form. Planterscape’s custom L-shaped CorTen planter serves as an inviting space for Sky Pencil Japanese Hollies. Known for fast growth, these columnar-style hollies are perfectly suited for vertical green screens. They are beautiful year-round and low maintenance! Mid-mod transformed! Planterscape’s CorTen planter boxes and elements provided the aesthetically pleasing additions to this landscape, transforming a dingy out-grown landscape to modern minimalism! Check out Planterscape planter boxes at http://www.planterscape.com!